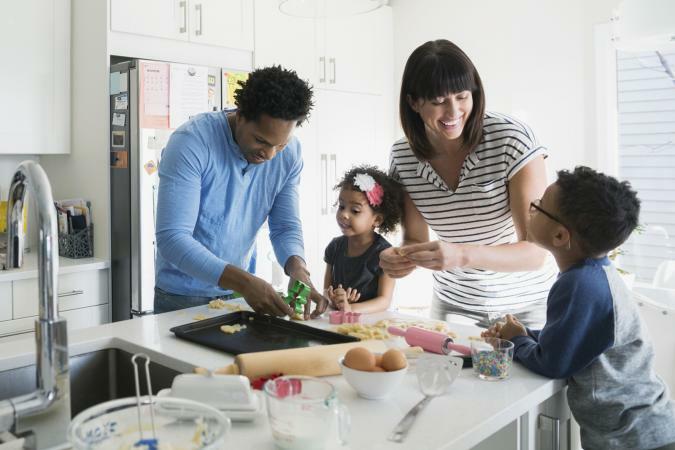 Co-parenting isn't always easy, but you can do it. All you need are some helpful hints to get you through the worst of situations. All parents go through challenges, but cooperative parenting has its unique issues that are not resolved by conventional parenting problem-solving skills. Raising children as a team after a separation requires a special set of skills and therefore, a unique survival guide when the following issues pop up. When you entered into parenting together, your feelings towards each other may have been at least amicable. However, since that time, you and your child's other parent have had conflicts that have changed your relationship. While it can be uncomfortable working with someone who doesn't like you, for the sake of your child, you and your partner in parenting must put your differences aside. Vow not to discuss the situations that have led to the change in feelings you have for one another and focus only on your child. If the other parent attacks you with words or uses your child against you, do not attack him back or the situation might get out of hand very quickly. Remind him this situation isn't the child's fault, and it's not fair to her she has to witness such violence between her parents. Resist getting into disagreements by telling him if he can't speak calmly and nicely, you will have to continue the conversation at another time. Be firm and follow through with your requests. Learn to compromise so you get what you want sometimes, and she gets what she wants other times. Set up a cooperative agreement by using a mediator, if needed. If possible, don't make decisions on the spot. In addition, if one parent won't agree and the other won't compromise, decide not to do it. For example, if one parent wants to take the child camping for two nights, and the other parent says only one night of camping is allowed, decide not to do the trip at all. If you can't agree on a situation that needs to be decided on, think only about the interest and well-being of the child. Disagreements between non-romantic parents are often the result of differences between the adults; the actual decision should be made with the child's best interests in mind. When children hear one parent talk badly about the other, they become worried and sad. These are negative feelings a child should not have, so it's best to stop the bad-mouthing immediately. Talk to the other parent as soon as possible. Do not mention the child has said something but rather discuss how your child has been quiet lately and/or upset. Mention you know there's no longer love between the two of you but for the sake of your child's happiness, it would be best to leave him out of it. If the situation doesn't get better, you may have to tell the other parent you've heard your child make some upsetting statements, and you would appreciate that he refrain from saying these things around your child. If you have a third party such as a counselor or mediator, you can have that person address the situation for you. If you have a co-parenting agreement or rules set in place for when your child is with his other parent and that parent doesn't follow them, the situation needs addressing immediately. Some people like to test how far they can go without repercussions. Let the other parent know you will not stand for her violating the rules you both set in place for the safety and well-being of your child. Tell her if she feels some of the rules are too stringent or no longer apply, you can meet to discuss a new agreement. However, until that happens, the parent must follow what you first decided on. If he or she is truly a jerk and doesn't take you seriously, continuously violating agreements and missing appointments, you may want to get a third party involved. If you work with a lawyer or a counselor, call him to intervene. If your parenting partner hasn't been around to see your child or has decided to stop being a parent, you can't force him to interact with your child. Instead, you need to meet with him to discuss what he would like his role to be as a joint parent. If he decides he does not want anything to do with the child or only wants very limited contact, obey his wishes but leave the door open for when he decides he wants to engage with his child. However, let him know when he does decide, it has to be at a time that is convenient for both you and your child. If your kids are young, your only line of communication with them is through their other parent during visits. If the kids have their own phones, it may be easier to keep in touch when they're not with you. However, sometimes the other parent might restrict calls or texts to and from you during "their time" with your child. This could be a case of retaliation against you or a way they focus the child's energy on their side of the family. Either way, there are a few things you can do to make sure you don't lose contact with your child and still respect their time with the other parent. Talk to your ex to determine their motivation and be honest with yourself about whether your calls and texts are too much. Respect the other person's time as you'd have them respect yours. Create a communication agreement with boundaries for the frequency and timing of non-emergency calls, texts, or video chats. Give kids the chance to dictate how much communication they need by giving them the power to communicate when they want to during visits. When you're both using social media to share information about your lives, it can create jealousy or raise questions about parenting skills and practices. As a general rule, parents should agree on what types of information or images to share and which not to share on social media accounts relating to their child. For example, if one parent is uncomfortable with bath time photos appearing online for a baby or toddler, the other parent should refrain from posting these images, as well. Cooperative parents also need to be cautious of what you say about each other on these public platforms. Negative and harmful social media posts can hurt the child, but they could also be used against the posting parent in mediations and court proceedings for custody arrangements. In most cases, discussing the situation with the co-parent is the best route. In stressful or difficult situations, you may want to consider seeking the professional help of a counselor or mediator. Whether the two of you work things out on your own or with the help of a professional, having an open mind and being flexible will yield the best results when problem solving.